I’ve never been one to wear lots of jewellery, even though I’m a bit of a magpie and will spend a good 10 minutes gazing at the displays of antique diamond rings in the window of the village jewellers. I wear a wedding ring of white gold with a tiny chip of a diamond set flush in the band and that’s it. No engagement ring, no earrings or studs even though I have my ears pierced at least twice on each lobe. I admire other people’s jewellery and the stories behind them, whether they are passed down from family members or given on significant birthdays. I have a gorgeous bracelet I coveted from a shop in Kent that used to be run by a friend of mum’s and then on my birthday one year, I opened the tissue wrapped present my parents gave me to reveal the same bracelet. I should wear it more often – it’s strung with glass beads of every shape and colour and absolutely one of a kind; this year should be the year of pretty things so I think it may be given a few more outings. My paternal grandmother was also not given to wearing lots of jewellery, but like me had a few pieces that were worn daily until she died. She also had a box of “pretty things” as I used to call them, costume jewellery, copper bangles and clip on earrings that were long since forgotten but irresistible to a curious, magpie of a granddaughter. She wore her wedding ring, which I’m ashamed to say I cannot remember the shape or colour or style of and a silver chain, strung with a tiny silver owl pendant, set with 2 tiny chips of blue glass for eyes. It was called, although I have no idea why, Ozzy Owl. It never came off from round her neck, not when we went swimming, not when we pulled up carrots from the allotment, not when we steamed up the whole house on wash day, not when we put on every item of waterproof clothing and went for a seemingly marathon distance walk around the Derbyshire countryside. I remember sitting on her lap, so I must have been 4, maybe 5 and gently playing with the owl, stroking the glass beads and tracing the tiny wings with my (probably) sticky fingers. She never told me to leave it alone, or that it was delicate or precious and I remember her saying that one day, it would be mine. Nanny died 2 years ago and her owl must have gone with her because it’s whereabouts are a mystery. I like to think Ozzy and Nanny could never be parted, even when she was no longer alive; we’ll never know. I do know that I have been drawn to owls ever since I was small, holding them at village fairs if I can, listening out for them at night when they split the air with their hoots and screeches and attempting to doodle them on most meeting notes. Occasionally, I have been known to make owl hoots at work, especially if someone say “who?” but that’s a whole other issue…I’m getting help for that. 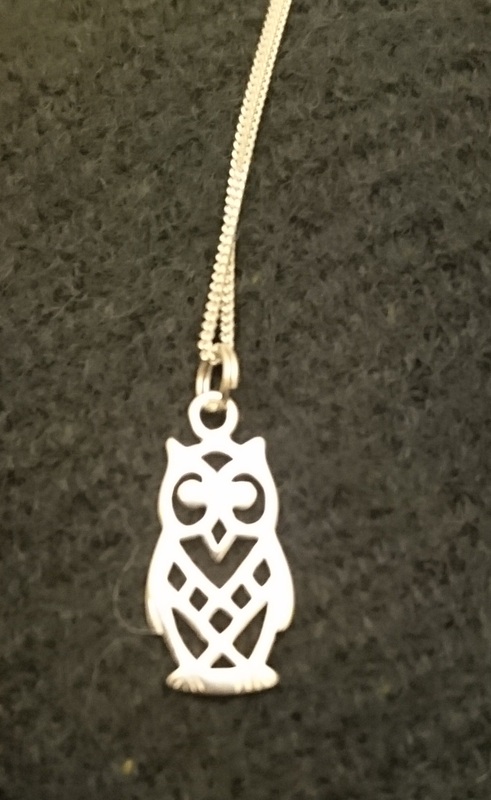 With the disappearance of Ozzy, I’ve been having a hunt for an owl pendant of my own, scouring Etsy and notonthehighstreet.com and the ubiquitous Amazon for a version of my grandmother’s talisman. I’ll let you in on a secret: owl pendants are everywhere! There is a style for every taste and budget, shoestring or otherwise. I eventually settled on a small, sterling silver geometric design on the thinnest of silver chain, so light I can barely feel I’m wearing it. I’m starting my own heirloom, whether I have children or not, I hope that one day, I may be able to pass it on to a younger generation. I like carrying on my grandmother’s tradition, even if I am the only one that remembers so much about that tiny pendant that she wore day in, day out for most of her life. It is a powerful memory, one that makes me smile when I think about her. Nanny would have been 100 this year, it was her birthday exactly a month ago. It seems appropriate that my new owl pendant arrived today, ahead of schedule.